How to think about prospects for both stocks in the coming year. Check out the latest Caterpillar and Deere earnings call transcripts. Caterpillar (NYSE:CAT) and Deere (NYSE:DE) are often seen as twins in the investment world. The stocks have historically had a relatively high rate of correlation, and they share exposure to construction markets. 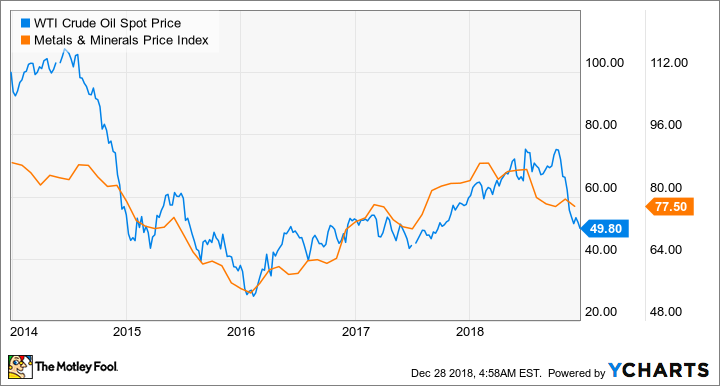 But recent events connected with the U.S.-China trade dispute have created a divergence in their prospects in 2019, and investors need to think carefully before buying into either stock. Let's look at what's going on. It's no secret that China's growth slowed in the second half of 2018, causing the International Monetary Fund to cut its forecast for the country's growth in 2019 from 6.4% to 6.2% -- a figure in line with the World Bank's outlook. Meanwhile, FedEx became the latest company to cite slowing growth in Asia (and Europe for that matter) as one reason for cutting its fiscal 2019 guidance. The interesting thing about the two companies' exposure to China and the trade dispute is that, at first glance, Deere seems set to be more heavily affected than Caterpillar. But on closer inspection, it's actually the other way around. Agriculture is front and center in the trade conflict. For example, China used to buy a third of U.S. soybean production, but according to the Department of Agriculture, U.S. export sales to China plummeted 94% by November in response to the application of tariffs on U.S. soybeans. Deere's core equipment market is the U.S., and if farmers are suffering financially, they are less likely to upgrade or buy new equipment -- bad news for Deere. That said, it looks likely that fears over the tariff dispute are overblown. For example, Deere's management recently argued that stronger market conditions in wheat, cotton, and corn would more than offset weakness in soybeans for U.S. farmers. Meanwhile, the rapprochement between Xi Jinping and President Trump at the end of November in Buenos Aires has led to China buying more soybeans from the U.S. again. And it's notable that the spread between U.S and Brazil soybean export prices has narrowed significantly in recent weeks after blowing up in the summer when tariffs on U.S. exports were applied. The reality is that China needs soybeans, and even if it buys more from Brazil, for example, U.S. farmers have an opportunity to sell into the markets no longer served by Brazil. In short, don't overestimate the danger from tariffs to Deere. Caterpillar management sought to downplay the importance of China during the company's third-quarter earnings call in October. For example, CEO Jim Umpleby pointed out that China contributes only 5% to 10% of Caterpillar's sales, implying that a slowdown in China wouldn't have a significant impact on the company's equipment sales. Unfortunately, it's not quite that simple. Demand from China for energy and mining commodities is probably the biggest single swing factor in determining prices for oil and gas, as well as metals and mining materials. Indeed, a quick look at commodity price trends shows a marked decline in the second half of 2018 -- when it became clear that China's growth is slowing. Commodity prices matter to Caterpillar because the investment case for the stock in 2019 rests on the idea that capital spending from miners and energy exploration and production companies is set to improve. Unfortunately, the recent decline in commodity prices calls this into question. Moreover, Cummins (NYSE:CMI), a major manufacturer of engines used in the energy sector and mining equipment, has already talked of "a little more cautiousness" for capital spending from its customers. In a nutshell, if you are worried about a protracted trade dispute between the U.S. and China and/or a general slowdown in growth in the Asian powerhouse, then Deere is the better buy. After all, even if China's economy slows, its growing population will still need to eat -- and in any case, U.S. farmers have other export markets they can sell into. Of course, if China will comply with President Trump's demands by agreeing to play by international standards on trade, and gets its economy back on track, then there's arguably more upside to Caterpillar. But until there's hard evidence of this, Deere is the better buy.